In this part we are going to move the WSS v3 database across to SBS 2011. After running the ststadm –preupgradecheck shown in the last post and not having any issues, the next step in the process is to copy the databases from the staging WSS v3 server to the SBS 2011 machine. The easiest way to do this is simply to stop the SQL service on the WSS v3 box. If you installed WSS v3 in a standard configuration the SQL database is Embedded Edition (##SSEE) so locate the Windows Internal Database service and right mouse click on it and select Stop. Now, locate the raw SharePoint content database files on your WSS v3 server. These are the same ones that you copied from SBS 2003 but are now upgraded to SharePoint v3. Copy these files to you SBS 2011 server. As with the migration from SBS 2003 to WSS v3, I recommend you backup your default SharePoint 2010 environment via a SharePoint specific backup prior to commencing. This makes it much easier and quicker to roll back if necessary. Now you can still do a backup via the good old STSADM command but Microsoft recommends that we do as much as we can with Powershell. So here’s our chance to get our hands dirty with Powershell. To launch Powershell select Start | All Programs | Microsoft SharePoint 2010 Products | SharePoint 2010 Management Shell. Make sure that you run it as administrator as shown above. This will create an export backup of the SBS 2011 Companyweb site at c:\companyweb.exp. 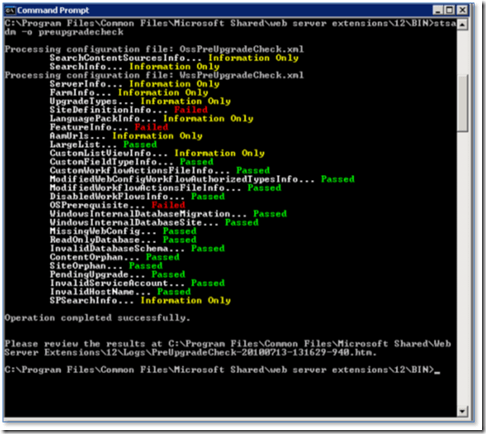 Leave the PowerShell console open for the time being and view http://companyweb. SBS 2011 has a fax center which is unique to SBS 2011 and is much easier to backup individually and restore in SharePoint than attempt to recreate. So once Companyweb is displayed click on Fax Center. Then select the Library tab at the top of the page to reveal the ribbon. In the ribbon select Library Settings (to the right). In the middle, under the Permissions and Management column select Save document library as template. Enter the details as shown above but make sure you check the option at the bottom to Include Content. 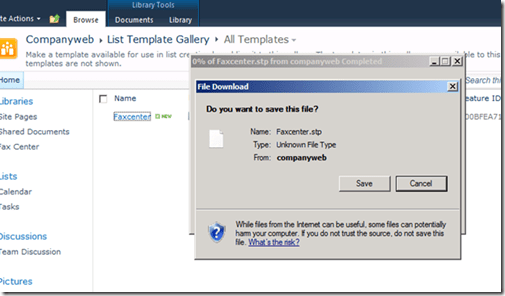 This will create and save a list template in the List Template Gallery. Simply visit the Gallery and click on the Fax Center template you just created and save it somewhere on your hard disk. As the screen shot shows you’ll be prompted to confirm this. Once complete the existing SharePoint content database has been removed from Companyweb. You now need to attach the databases you copied from you staging WSS v3 to your SBS 2011 server. When you attach them it is also probably a good idea to rename them to ShareWebDb just to remain consistent going forward. This rename process will firstly require you to detach the existing ShareWebDB from SQL Express 2008 R2, attach the copied databases renaming in the process. This isn’t too difficult and I’m not going to go through it here. This will reconnect the new (copied from WSS v3) databases (now called ShareWebDb) to http://companyweb. During this process you will see a percentage complete displayed as the WSS v3 databases are converted to SharePoint 2010 format. If you now visit http://companyweb you should see your old content displayed in the new SharePoint 2010 interface. 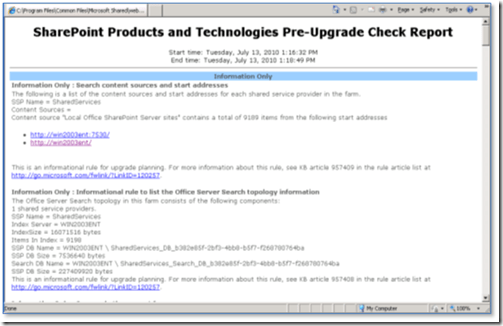 In the next post I’ll cover off some tidy up, including how to re-import the Fax Center, enable health and analytics reporting as well a few other things I believe ‘must’ be done to make SharePoint 2010 as functional as possible. I’ve just uploaded a new video to YouTube that shows you how to detach and attach SQL databases via the SQL Management Console. <img src="http://lh6.ggpht.com/-pqqxckqjdc8/UOzV5j5n08I/AAAAAAAAG48/ys-erSMjR7k/videoee60a66c7a88%25255B4%25255D.jpg?imgmax=800" style="border-style: none" galleryimg="no" onload="var downlevelDiv = document.getElementById('4c6ea4c4-d93f-41aa-b09c-1637314ddd0f'); downlevelDiv.innerHTML = "
Although only very short and simple in my experience I have found that many people tasked with administrating SharePoint (which relies on SQL) do not know how to perform these simple operations. The detach and attach process is really handy if you want to manually move the SharePoint content bases to another location on the disk. Subscribers to my SharePoint Guide will receive an extended video covering additional topics such as how to completely remove SQL databases as well as rename them. The Guide not only provides video tutorials but extensive notes. For more information about becoming a subscriber visit www.wssops.com. In this part we are going to run a check to ensure that our original SBS 2003 Companyweb site (now in Windows SharePoint Services v3) will migrate to SharePoint Foundation 2010. Prior to any upgrade from WSS v3 it is recommended that you run the stsadm –preupgradecheck from the command line. To do this go to the command prompt as an administrator on the WSS v3 server. Change to the directory c:\program files\common files\microsoft shared\web server extensions\12\bin. At this location type the following command and press ENTER. It is recommended that you read the report carefully and note any warnings and errors as they may prevent successful migration. Some errors may not be relevant. For example in screen shot above you will note that the error indicates that the system is not running on a 64 bit operating system. This will not apply in the situation where a migration to new hardware is being undertaken. The –preupgradecheck option is only available on WSS v3 installations that have WSS v3 Service Pack 2 installed. If everything looks good then you are ready to forklift the WSS v3 databases onto SBS 2011 and attach them to SharePoint Foundation 2010 which I’ll cover in the next part. The latest episode features Ryan Spillane from Correct Solutions speaking about the processes and challenges of recruitment. We covers areas on what to look for in a good employee, how to find good staff, the interview and induction process. I hear so many resellers complain that moving to cloud services (especially Microsoft BPOS) will mean that they and their customers will receive worse support that they are currently obtaining. That is total and utter bullocks in my opinion and experience as the following demonstrates. After creating a new partner BPOS account for use in demo’s a while ago, I logged in yesterday to run a Live Meeting and was greeted with the fact that my ‘trial license’ had expired. Damm. 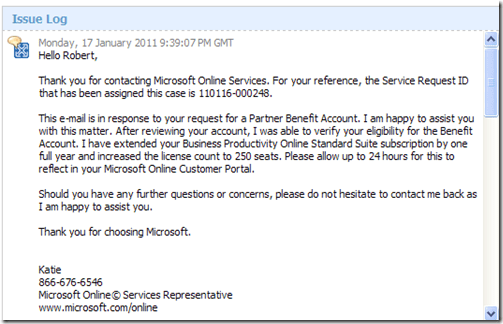 Because I’m a registered BPOS reseller I can get access to a 12 month, 250 user license. Obviously, something hadn’t aligned and I was still considered to be on a trial. I started muttering under my breath that this was going to a real pain to get resolved and would require numerous phone calls, emails, proof of my reseller status, yadda, yadda, yadda. Then I remembered that I could submit a service request directly via the BPOS console. So I dutifully sent one off with all my details and what you see above is the response. One simple request and had my problem resolved and I’m back in business. Pray tell how this could ever be considered worse service just because it is a cloud application? Hmmm? Honestly, in my experience the support via the BPOS console has been absolutely stella and I have no hesitation recommending to anyone. Well done Microsoft. To all those who think cloud services means worse support I say think again! but I’m now going to add something extra. Every month I am going to try to add a bit of a video summary of the newsletter so you can get a look at exactly what technologies I talk about in action. <img src="http://lh5.ggpht.com/-jW5laqqSluY/UOzUTyAhxjI/AAAAAAAAG4A/LPe2uWP7_CU/video72e583c3a4cf%25255B4%25255D.jpg?imgmax=800" style="border-style: none" galleryimg="no" onload="var downlevelDiv = document.getElementById('1a72503e-90a6-4bec-8337-635031b4ba9c'); downlevelDiv.innerHTML = "
Having just obtained a new laptop I have been a bit pressed to get it into service for this edition so things might be a little rough around the edges. However, I hope to have all these issues smoothed out shortly and have the video optimized for YouTube viewing. The aim will be to provide an adjunct to the email newsletter that will actually show you some of the technologies I mention in more detail. I’m also hopefully aiming to add a few ‘extras’ into the video to encourage additional viewers. So have a look and let me (director@ciaops.com) know what you think and what you’d like to see me cover in future editions. I’ve recently purchased a new laptop after my old one (7 years of dedicated service) lost a portion of the LCD screen. Fear not! It has been moved onto other tasks with an external monitor but I’d though I’d take the opportunity to run your through my setup process for the new beastie. 1. Power the machine on and let it completely finish installing all its software. 2. Reboot the machine to a Storagecraft boot DVD and take an image of the machine before anything further. You can do this before the machine even powers up to Windows but as you’ll see in the next step I’ll create another backup that will allow me to return the device to delivery state. 3. I boot back into the machine and use the manufacturer supplied Recovery Manager to create a set of recovery media. In this case it meant 7 DVD’s. So now I can get it back via an image as well as back to delivery state via the recovery media. 4. I now upgrade the version of Windows from Home Premium to Ultimate to allow all the Windows professional bits needed. I’ll also uninstall all the manufacturer crap that has been installed and make the machine as lean as possible. 5. I then use Truecrypt to do a encrypt all the hard disks on the machine. Sure I could do this with Windows Bit Locker but I believe that encryption should be open source. I don’t trust an algorithm that is proprietary. This now means that if the laptop gets stolen the information on there is safe, even if the disks are removed and inserted into another machine. Be warned, full drive encryption can take a long time to complete but Truecrypt allows you to pause and restart the encryption process at any point. 6. I install the latest version of Office Professional. In this case Office 2010 Professional Plus. I also install SharePoint Designer 2010 and SharePoint Designer 2007 (which are both free downloads). 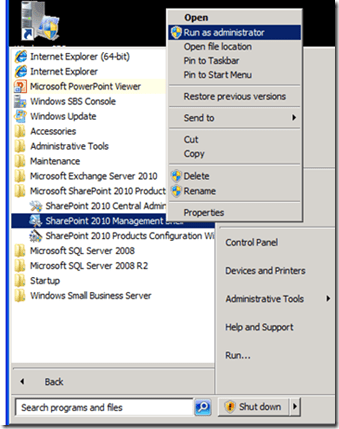 SharePoint Designer 2010 will only work with the latest version of SharePoint Server. Thus you still need SharePoint Designer 2007 when working with Windows SharePoint Server v3 or Microsoft Office SharePoint Server (MOSS). 7. I do a Windows Update and change the options to check for all Microsoft updates and in future only prompt me when updates are available. I always keep running this until there are no more updates. 8. The machine came with Windows Security Essentials. Most other AV products are just too bloated and cumbersome. I also however also install Malwarebytes (another free download) and scan my system with this manually once a week at least. Virtualbox – this allows me to create virtual machines with 64 bit guest (i.e. 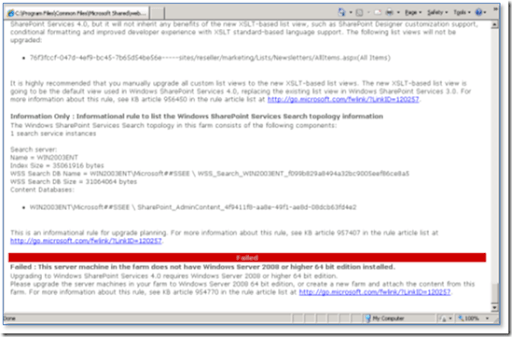 for creating SharePoint 2010 test machines). I was disappointed to find that Windows XP Mode doesn’t allow 64 bit guests so this is what I now use. Windows XP mode and Virtual PC – again for virtualization and running an virtual XP machine for backwards compatibility if required. Window Live Essentials – I use the writer for blogging, messenger and a few other apps here. All free to download and very handy. Audacity – For editing sound files, especially CIAOPS podcasts. iTunes – Great for music but there are also plenty of great podcast and free training videos on all subjects here. 10. I install Firebox and Chrome browsers and set Chrome as my default (because it is the fastest). I need all these to test with SharePoint but Chrome is definitely my default browsers these days. 11. Now I install Lastpass which contains all my web site passwords via the cloud. Not only will it automatically fill them in for sites you visit regularly but it will also generate and remember secure passwords for new sites. Thus every new web site I sign up has a unique secure password. If you haven’t looked at Lastpass I recommend you do as it also integrates will all browsers and mobile devices. 12. I’ll install the Delicious browser add ons that allow me to bookmark and share my sites with the world (and any other machine I have via the cloud). 13. Next comes Camtasia Studio which allows me to create my video tutorials and presentations. 14. The Storagecraft desktop edition is install to allow me to take image backups of my whole machine for easy restoration. 15. To keep track of my time on the machine I install the Recuetime and Wakoopa agents. 16. To manage my Twitter feeds I install TwInbox. 17. To allow me to create PDF’s I’ll install PDFCreator. 18. I’ll do a defrag to line everything up that just been installed since hopefully not too much should be shifting around. 19. I’ll reboot and go into the BIOS and enable the password boot option. This means I have to put two passwords in at boot time, the BIOS password the hard disk encryption password. The BIOS password adds to security and allows me to easily shut the machine off if I turned it on by accident. It also allows me to insert a DVD if I need to boot from it rather than simply booting to the hard disk immediately. 20. I also change the boot order in the machine so it boots from the DVD first, which I’ll need if I have to do a recovery. 21. I then run Spinrite in full maintenance mode to check the hard disk and make sure there aren’t any bad sectors lurking about. Generally if a hard disk fails it is going to fail in the first few weeks so using Spinrite allows be to detect this early on the piece before I get too much further. I could do this before I start install all the above software but usually by now I am sick of computers and need a break so I leave Spinrite to do its work. Be warned that depending on the size of your hard disks this could take quite a while. There still a few more tweaks and installs that I’ll do before I’m 100% complete but that’s the list of all the major stuff before the data even hits the machine. When it’s all done I do a final Microsoft Update and a Storagecraft image and I’m good to go. Sure it takes a long while to set up but my last machine is still going after 7 years and I would like this one to last even longer, so I’m happy to invest the time up front getting things right. I’d love to hear what ‘standard’ stuff you install on your machines. Let me know via (director@ciaops.com). As part of the effort to assist people in the flood affected areas of Queensland and NSW the CIAOPS is offering a free hosted SharePoint site to any business or organization affected by the floods. A SharePoint site could be used for any number of tasks to assist with collaboration between groups, keeping and updating lists and contacts as well as tracking information. This offer also includes any setup, maintenance and customization required. Such a site can be accessed anywhere that Internet access is available. To take advantage of this offer simply contact me directly (director@ciaops.com) to arrange. Likewise, if you know of any business or organization that would benefit please also let them know of this offer. Tweet far and tweet wide. We all keep the people affected by these floods in our minds, remind to keep safe and remind them that like everyone else, we are here to help if needed.